summertime is the time for fun prints, bright colors and strappy sandals. this outfit embraces all of those things! the shoes have been a hot commodity on my instagram along with the tote. 'Huarache' sandals were a staple of the 70's and they are still a staple today. this particular Steve Madden pair is not only affordable but relatively comfortable. for a four inch heel that says a lot. 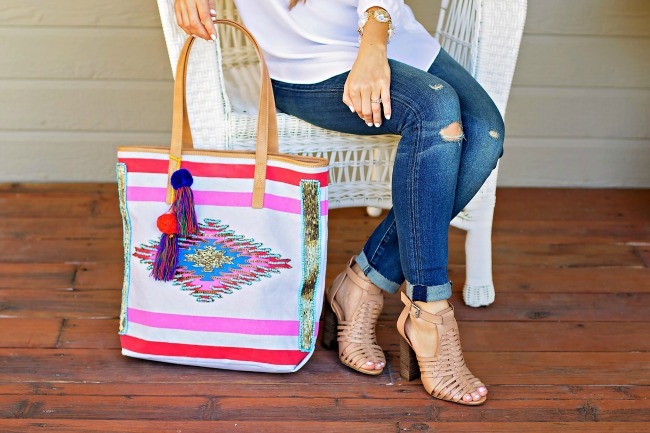 the bag is Sam Edelman for summer with a great tribal print with beaded turquoise details and fringed poms that hang from the handles. it is very colorful and goes with everything. remember a few weeks ago when i was raving about my high-waisted denim? i loved them so much i bought another pair in a different wash. high-waisted denim has been given a modern twist and it is much more wearable without looking too mom-ish. the top is my other recent double purchase. i loved this top in blush i knew that i had to have it in white for versatility. these gorgeous spring blooms won't be hear for long and i am soaking up every minute with them. be sure to visit the end of the post for shopping details.